Experiencing Cape Cod’s natural habitats first hand and learning about their inhabitants increases our appreciation of the amazing interdependence of nature’s patterns. Everyone is encouraged to join us and share knowledge on species identification, nesting, habitat, where and when to find the species that share our waters and woods. Some trips will include tips on nature photography. Bring a notebook and binoculars on your trips, and wear rugged and comfortable shoes. Trips last an average of two hours. Call Nature’s Circle, 508-564-4331, for further information for these events and for additional scheduled walks. All are without charge and open to everyone. Do join us. You don’t know what you have been missing! Beaches are the interface between land and sea. They provide habitat for certain plants and animals such as Beach Rose, Dusty Miller, Beach Poppy, Jimson Weed and Sea Rocket. Among the plants and sand grains live tiny animals that birds feed on. Beaches change shape under the pressure and force of the wind and waves. Sand is carried away and new sand is deposited. Winter beaches look different from summer beaches. Since sea level is rising globally, sand is being blown and washed over the dunes and deposited on the back of the dunes. Gradually the dunes are moving toward the upland. If there is a lagoon or pond between the dune and upland, it will move up on the landward shore, keeping its surface level the same as the sea. Even so, the line of dunes or barrier beach will continue to protect the lagoon and marsh inland of it, where more fragile plants and animals live. The estuaries, marshes and lagoons support the animals that feed the larger creatures of the oceans. It is said that eighty percent of the marine animals either begin their lives in estuaries and salt pond or depend for their food on the animals that do. 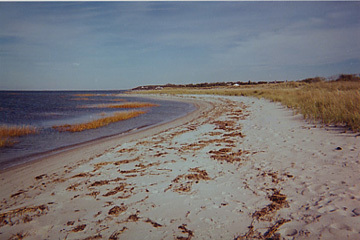 There is a series of barrier beaches along the south coast from Woods Hole to Mashpee, the greatest of which is South Cape Beach. Field trips for birding and coastal studies meet at South Cape Beach where we learn about all of the above and cross over the upland just above the marsh and enjoy Blueberry, Swamp Azalea, Sweet Pepper Bush, Bayberry, and Path Rush. We move into the Pine/Oak forest, enjoy the Inkberry and Poison Ivy, cross a small bog, walk on a dike between marsh and bog, and return to walk the back of the dune finding Horned Larks, Whimbrels, Song Sparrows, Oyster Catchers, Black Ducks and Ospreys. Wetlands include freshwater marshes, bogs, swamps, rivers, moist meadows, ponds, lakes, salt marshes and tidal flats. All of these wetlands are integral parts of the ecosystem. Each wetland is special habitat for the animals and plants that live in it. Each is a part of the whole system without which the system begins to break down. Freshwater marshes provide living space for Red-winged Blackbirds, water voles, snails and crabs, and Cattails, rushes, Marsh Mallows, Poison Ivy, and much more. Bogs support cranberries, and Pitcher Plants, Blue Flag, Sundews and Cotton Grass. Red Maples, Blueberry bushes and Atlantic White Cedar have their own specific swamps. On the banks of quiet rivers may be found True Forget-me-not, Turtlehead, Cardinal Flower, and Spartina pectinata, a tall graceful grass. In the Salt Marsh the related Salt Cord Grass, Spartina alterniflora, and Salt Hay, S. patens, share space with Sea Lavender, Saltmarsh Aster, Spike Grass and several kinds of snails and mussels and spiders. Moist meadows look like ponds in spring but are spongy meadows in summer. 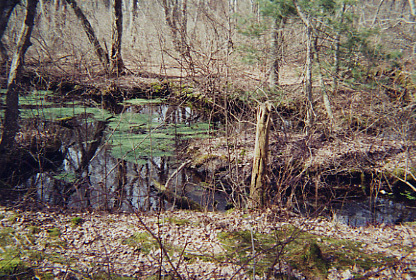 Wetland plants such as Swamp Candles and Meadow Beauty grow there. Tidal flats are home to clams and worms and very small creatures that live in the sand and mud. Shore birds depend on tidal flats for their food.